This time the module looked more like a regular study session. We had two dominating subjects that took 80% of time every day: ‘Decision and Data Analytics’ (Robert Taylor) and ‘Leadership Fundamentals’ (this week – Sue Dobson). However, the first thing that was interesting for me was our GOTO tutorial session, as after it I had my first mark. Well, they could have been better, both the session and the mark. The mark was B. I was good enough in the presentation, but missed the point of the question a little. I see that it will take more time to get used to the academic writing style. The session was to be a kind of ‘tutorial’, whatever that means, but in fact we just exchanged some ideas on the topic and broke up. In this project, the bigger part of the work is on the Internet with the reading lists and research, and our next step will be a serious challenge: we have to find a person, who is an expert in Big Data, and record an interview with them. I am wondering if I can get to the Main Data Centre of Russian Railways, or even Deutsche Bahn, covering myself with the name of Oxford. It would be great, as I know a lot about the possible usage of data there, so I can prepare a good plot for the discussion. Formal dinner at Rhodes House. It was a little bit dark so I could not make a better photo. By the way, social life now boils over. We have a group on Facebook, people plan trips for this year (it will be Tel Aviv and Moscow), and every evening something is planned, from tennis to speed dating clubs. 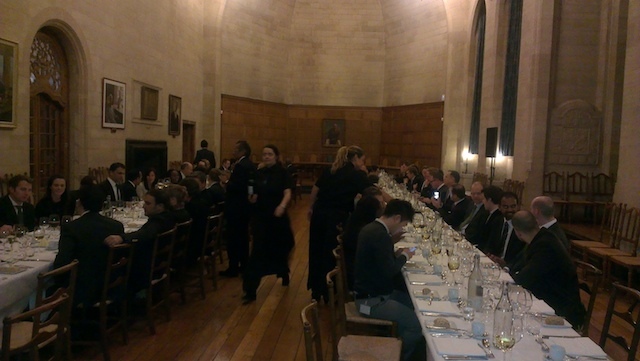 Once per module we will have a formal college dinner, but this week I had two of them: another was in my college. A formal dinner is a very beautiful event with great food, but honestly, I cannot understand how they tolerate those dinners every day (we attend them only once a week, but for the fulltime students they are just regular dinners). For me they are too long, but here it is a lifestyle. Oxford has a very unusual mix of old formal rules and at the same time full freedom, and informal style in cases where I expected formality. In general it looks natural, but it is different from the things I have seen elsewhere. Every day this week started with Decision and Data Analytics. We have finished with that course, and now we just have to prepare two assignments. One is for small groups, it is a case on multiply regression, and the second is individual and on decision trees. Though we had started from regular lectures, classes soon became a mix of lectures, seminars and group work. Surprisingly, the final tasks appeared to be much more complex than I expected. Step by step, we finished with the group assignment, so we do not need to do it distantly, but even with my experience in statistics I made many mistakes. The DDE course was the first more or less clear case of group work. Only here I found how bad I am at group work. All that I did for the last 15 years was work with my employees, or clients, or partners. That is, I worked in groups with clear roles and hierarchy. However, in a group of six equal people without any role and with urgent necessity to organise our work, we were lost. It is one of the things I have to learn here. Another major course of the week was much easier. Each session of Leadership Fundamentals consisted of some lecture materials, group discussion of a case and then discussion with the class. The only really hard part was to read the case, as they were about 20 pages each. The course was fun. I cannot say that we studied a lot during classes. Classical study was moved to our readings, and cases were something like a bridge between our life situations and theory. I finished this week’s part of the course without any idea what to do, but with some guidance for further study. I think it is expectable, taking into account the field of study. In the middle of the week we had a session called “Asset Profitability in Practice”. It sounded like a financial course, but in fact it was a fun game with very important results. In this game, a half of the class (about 35 people) imitated work of a factory. Everybody had his or her roles and we ran through three cycles of work trying to organize it optimally. Of course, I understood that manufacturing processes can be optimised, but I did not expect the extent of optimisation. We got two times higher production volume in the third circle and finished 10 times more orders in time. It looked like a silly game, but all those situations, when you are trying to do your best, failing, then getting things done and being able to see what helps, make the base for the application of theory. This course was a warm-up before Indian module, where David Upton waits us with his cases and ‘Operations Management’ course. This week I tried to use Oxford’s libraries. They are good as places for work, though The Sainsbury Library (business part of the main library, it occupies two stories of the central part of the SBS building) sometimes is quite noisy. The Keble’s library was beautiful and quite, but it is too far from the business school to be a place for work. I still have not grasped most of library resources. They are vast. In fact, it is possible to get access to any book, magazine, paper article or database in the world. We get all the necessary books from the business school, but it gives interesting possibilities for additional research.